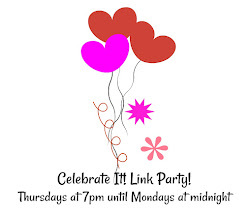 I am a huge St. Patrick's Day fan, so I am excited to show you what is definitely the first of several recipes to celebrate March 17. These Shamrock Mini Cheesecakes should be a part of your party plans! 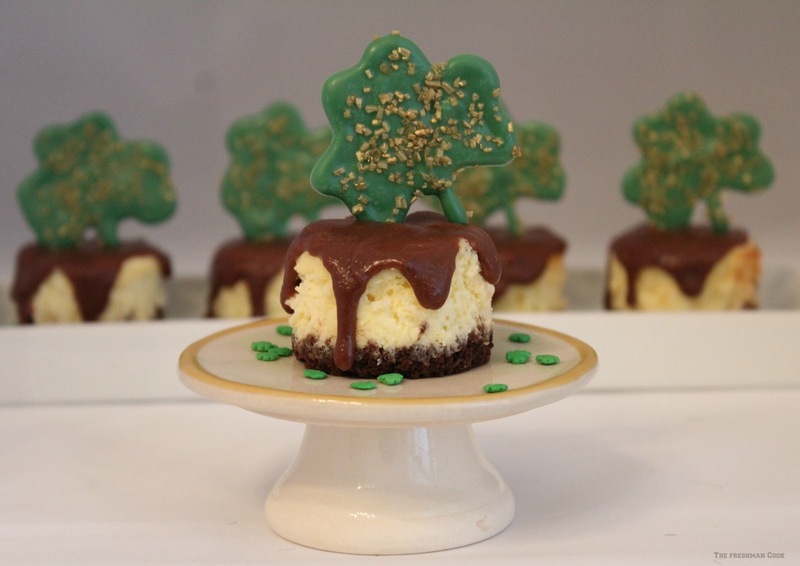 They start with a chocolate base, are filled with vanilla cheesecake, topped with a milk chocolate ganache, and the topper is melted candy melts shaped into a shamrock. It is easy to make these sweet, festive treats! In a small bowl, mix together the graham crackers and the butter. 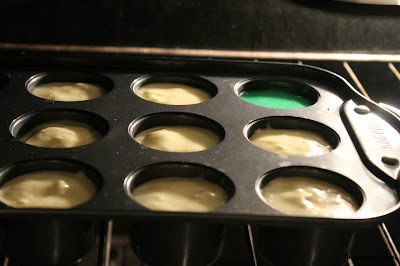 Place a tablespoon of crust in to each cavity opening of the pan. 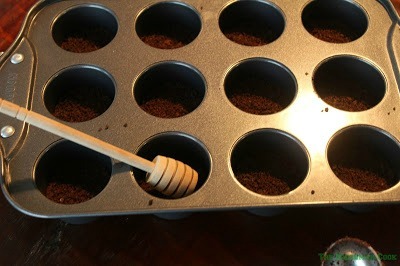 You can also use cupcake liners in a cupcake pan. They work great. There will be fewer cheesecakes because they are a bit larger. 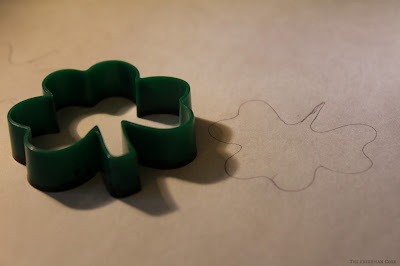 Use your shamrock cookie cutter and trace around it on parchment paper. You will need one traced shamrock for each cheesecake. Melt the green candy melts, and place it in a plastic decorating bottle. 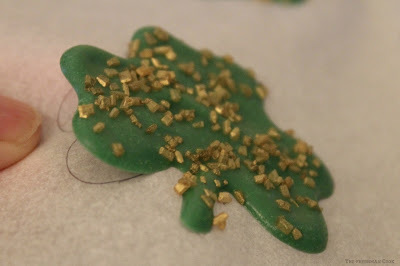 Turn your parchment paper over and trace the outline of the melts, and then fill it in. 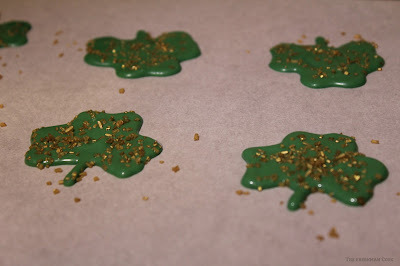 Sprinkle the gold over the shamrocks while they are wet. Let dry. Combine softened cream cheese, sugar, whipping cream, and cornstarch in a large bowl. Beat with mixer until smooth. Add the eggs and the egg yolk one at a time, beating after each addition. Add in the vanilla flavored syrup and the extract. Pour batter into each opening, on top of the chocolate graham cracker crust. Bake at 350 degrees for 15 minutes. Check if it's done like you do for a cake~with a toothpick. Take a toothpick around each cake, then let cool completely. Remove from pan. Let cool some more. Chop the chocolate in to small pieces. Place in a double boiler and melt on low. 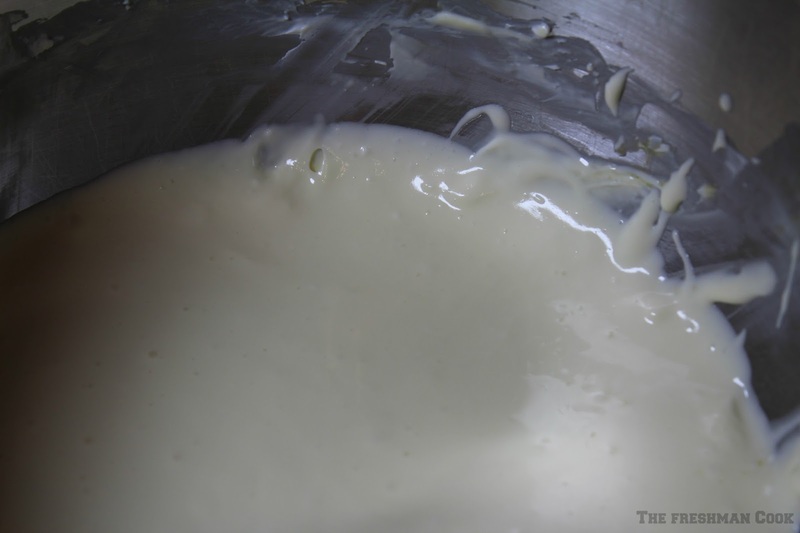 Heat the whipping cream in a separate pan or in the microwave. 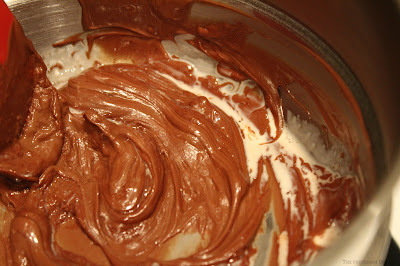 Add the warm cream to the chocolate a little at a time, until the consistency is smooth and drizzly. 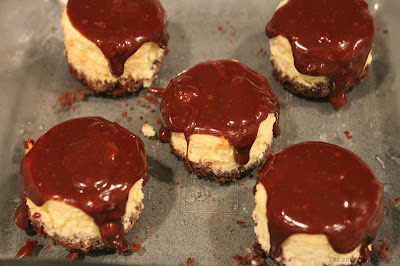 Use a spoon to drizzle the ganache over the cheesecakes. Release the shamrocks by pulling the parchment from the bottom. They release very easily. Place a shamrock on each cheesecake and enjoy! Thanks for stopping by today! I am so happy you did! Here are some past St. Patrick's Day treat you might enjoy! 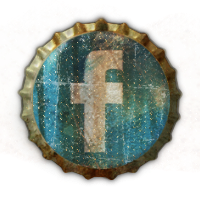 Look for some new ones coming soon! 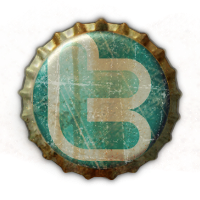 A Tip of Me Hat To Ya!